So what makes a good multi-tool? That’s a bit of a loaded question, it’s bit of a subjective answer. Putting price, experience, and local laws aside there are a few traits that I find to important when it comes to choosing anything I’m going to be depending on. These traits are universal and can be applied to any multi-tool, however, the different factors maybe be more important to different people. Always remember this is a tool, and a good tool should be durable. Durability should be a major factor to consider before choosing a tool. This is what will determine how long-lasting the tool is, changing it from a purchase to an investment. Durability dictates how the tool can be used, and how hard of a job it can do, as well as how long you can depend on it. How comfortable is the tool to carry? Can you do so in your daily attire? This maybe is an important decision for a multi-tool. Those big, powerful multi-tools are designed to be carried in a sheath may not be suited for the office, suit and tie variety. Also, if it’s too heavy to carry, or too annoying, what’s the point in owning one? Different tools do different things, and different multi-tools have different tools. So you need to decide what are the tools you need in your daily life. This answer will be different depending on your lifestyle, the electrician will need a different set of tools than the camper, and the camper will need different tools than the office worker. Does the tool have the tools you need? In general a good multi-tool should be durable, comfortable to carry, and be filled with the right tools (this is key). A good multi-tool is only as good as the “multiple” tools it has. There are a few things to avoid when looking for a muti tool though. First off never trust a multi-tool with a flashlight. The light will always fail. Next, be prepared to spend more than ten bucks, actually be prepared to spend anywhere from 30 to a 100 dollars on a multi-tool. 30 dollars is an appropriate price for a smaller, more compact multi-tool, with 50 to a 100 for a larger tool. Cheap tools just can’t be depended on, and if it doesn’t have a brand name you can associate with quality, avoid it at all costs. Oh, so you are new to the knife world, and even newer to the multi-tool world, well I’m going to leave you hanging here, I’ve put together a versatile group of three different multi-tools, each does something a bit different than the other, and each is of the utmost quality. If these specific models do not work for you, then at least you’ll have the name of a few reputable companies. Each of these companies is a well established in the knife and multi tool industry and each has been producing a variety of high-quality tools and knives for years. SOG has been around since the 1980s and is primarily a knife company, but has diversified into a variety of different edged tools. Included is their line of Multi Tools. 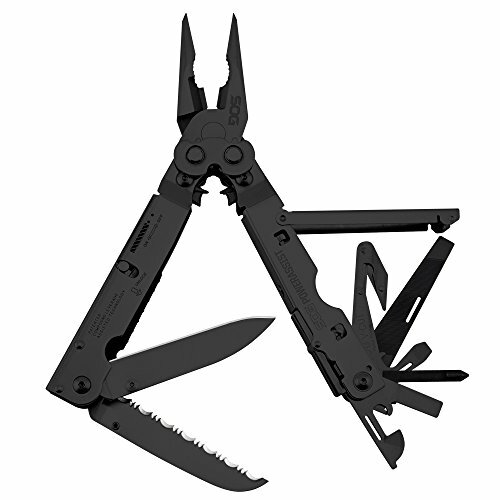 The SOG Power Assist is one of these multi-tools. First you get a high quality, durable, multi-tool, that comes attached with a pretty normal set of tools. The Power Assist comes in two finishes, either a shiny steel or a matte black. Both feature stainless steel knife blades, but the matte black model is coated. The Power Assist is constructed from a durable, but affordable 420 hardened steel. These blades are probably the strongest point of the knives. As primarily a knife company SOG knows what they doing when it comes to blades. The SOG Power Assist has two blades, one is a traditional straight knife blade, the other is a completely serrated blade, giving you the best of both worlds. Safety is a major consideration with knives like this, especially when you are using the other tools. The last thing the operator would want is for the knife to pop out at an inopportune time and cause an injury. These blades are held in place by safety switches that allows the user to operate the tools with peace of mind. The Power Assist offers a total of 16 tools, including the two blades, and even offer certain niche tools. For example, the blasting cap crimper is probably not useful to many, but may be a consideration for those in the demolition industry, or the military and police. 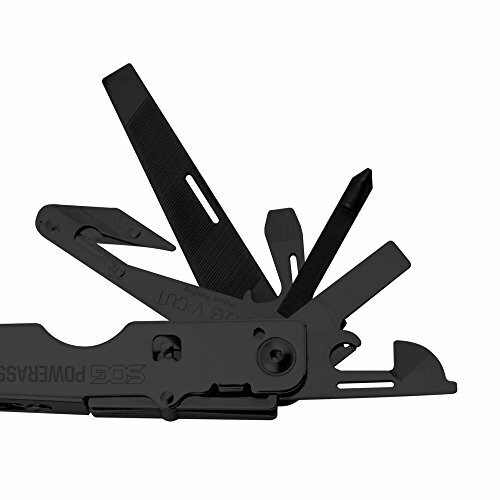 The SOG Power Assist is a well built, but a heavy multi-tool and is not quite pocket-friendly in size. Another complaint would be the blade length, depending on the local laws the 3.75-inch blade may be considered a weapon. You can check out this listing for the latest pricing. This maybe a little bit biased. 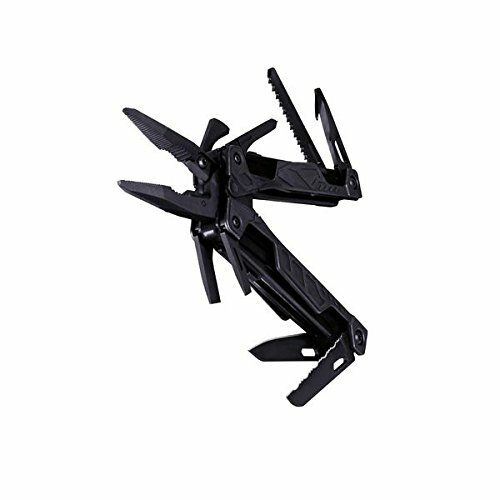 My first multi-tool was a Leatherman, and I have been consistently loyal to this company. Why do you ask? Because I bought my 1st Leatherman 6 years ago, and have taken it around the world twice, to war, to famine, and even to brush fires, and I still use it to this day. The Leatherman OHT is something a bit revolutionary from Leatherman that may have me retiring my current Leatherman. The OHT is made from 420 high carbon steel to not only be tough but maintain a good edge on the blades after heavy use. The tool is coated with black oxide to provide a matte finish, and a durable, rust-proof multi-tool. If you are wondering what OHT stands for, it’s simple, One Hand Tool. Both the pliers and blades are completely operable with one hand. This is quite handy once it comes to construction, or serious tasks, you may be holding onto a ladder or a piece of live wire, and you can’t spare two hands for your tool. The OHT is equipped with spring opening pliers, so once you start working with one hand, you never have to revert to two hands. 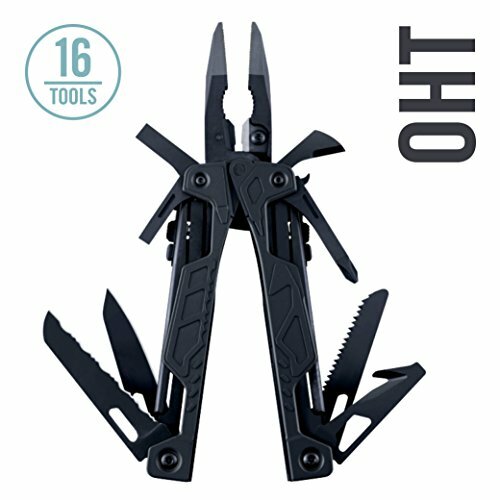 The OHT is very much a general purpose multi-tool, designed to offer a generic set of tools that most will have a need for in everyday life. Some tools of note though are the strap cutter, gun cleaning rod adapter and oxygen wrench. The OHT would certainly excel as a survival or emergency based multi-tool for self-sustainment, or EMTs and Firefighters. The OHT is again very heavy, at 9.9 ounces it’s going to pull your pants down a bit without it’s sheath. It’s big too, so it’s not pocket-friendly. Another gripe I have is the sheath, it seems kind of cheap and poorly constructed for this tool. It tends to sag and does not feel like a long lasting sheath. Overall all though the OHT is a great multi-tool in general, but the one-handed operation, and spring assisted pliers do make it stand out. You can check out the latest pricing options here. CRKT aka Cricket aka Columbia River Knife and Tool company is quite the revolutionary when it comes to knives and tools. No one can ever say they do not go out and innovate. Except for their naming process, it’s the CRKT Tool, oh which one? The one called Tool. So the CRKT Tool is designed by tool and knife maker Ed Van Hoy and Tom Stokes, and they did design a very unique multi-tool. This one if off the charts in the carry comfortable rating and is perfect for the tech or white collar job. Small enough to fit in the pocket the CRKT tool offers the bare necessities of a multi-tool. The CRKT Tool is essentially five different tools packed into a pocket knife sized package. The tools include a knife blade, a Phillips screw driver, a flathead screwdriver, a wire stripper, and a multi-fit box wrench. The box wrench can fit any ¼ inch hex bit, and included with the CRKT tool is ten bits, with a variety of different sizes and uses. I do not count these bits as individual tools on the CRKT tool since they must be carried separately from the kit. However, the most used tools in a multi-tool are the screwdrivers, blade, and pliers. While you lack the pliers, you are equipped and ready to go with 2 out of 3, and according to Jack Nicholson, that’s not bad. You can check out the latest prices here. I hope I have provided you a few options for you venture in multi-tool world. 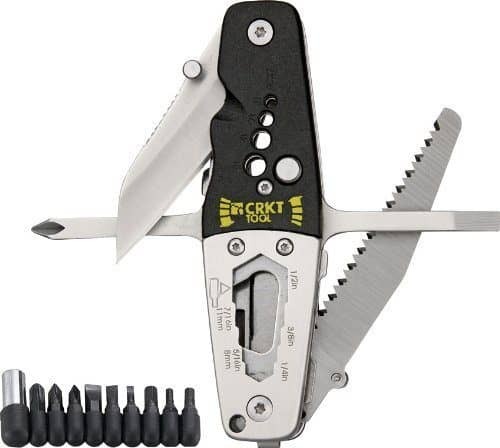 I personally vouch for the CRKT, SOG and Leatherman, as quality multi-tool makers. I believe any piece they make is useful and handy, and durable enough for 99% of the population. That other 1% plays with volcanoes, or tornadoes or something.